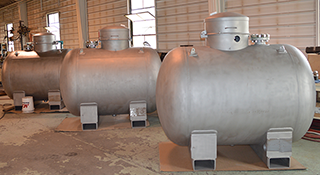 At Columbiana Boiler Company, we work directly with our customers to fabricate custom non-DOT (Special Permit) Specification Cylinders (Portable Vessels). This process includes developing concepts, designs, engineering, CAD drawings, final designs, manufacturing and sale. These cylinders all conform to US Department of Transportation (DOT), Transport Canada (TC) and European regulations. We have the engineering and regulatory skills needed to provide a turnkey conceptual design to fabrication project to meet your transportation needs. We know that you have very specific requirements and our capacity and pressure transport packages are tailor-made to your exact specifications. 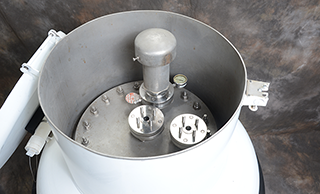 Columbiana Boiler Company manufactures a range of stainless steel 4BW cylinders designed to handle the most aggressive gases and liquids under Class 2 (Div. 2.3) or Class 6 (Div. 6.1) poisonous-by-inhalation (PIH) commodities without any of the restrictions imposed upon other transportation packages under DOT-SP 11580 (use of stainless steel instead of carbon steel). These stainless steel cylinders have been approved by the US DOT for the critical transportation needs of hypergolic fuels used as rocket propellant. Hypergolic fuels consist of two components: a fuel, such as hydrazine, and an oxidizer, such as nitrogen tetroxide, which ignite spontaneously upon contact. 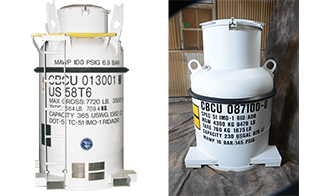 In addition to being approved as a US DOT specification cylinder, CBC’s cylinders can be approved up to UN1A1/X2.0/3440 as performance-based packaging for liquids. The use of UN-approved packages is authorized by the IMDG Code for international sea transport (IMDG# 2010020015). For PIH in Zone A materials, CBC cylinders do not require overpacks, a practice also known as double-drumming. For PIH in Zone B materials, our cylinders do not need to be shipped in dedicated vehicles or freight containers. 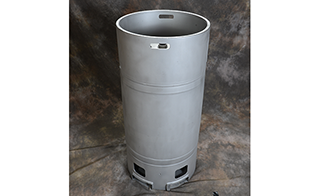 For both classifications, CBC cylinders can be sized to have a capacity of up to 119 uswg (450 liter), which is more than double the 58 uswg (220 liter) authorized for UN-approved drums according to US DOT regulations. 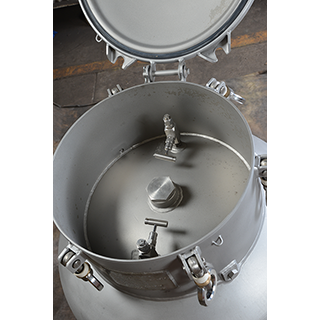 Columbiana Boiler Company manufactures a variety of intermediate bulk containers (IBC), vertical drums or portable tanks intended for the transportation of dangerous liquids and gases. This includes corrosive and poisonous-by-inhalation liquids and compressed gases. These high-integrity intermediate bulk containers are also used for less dangerous products such as materials with very strong odors, where maximum product retention is desired to avoid environmental problems. Additional Options: protective or structural frames, stacking capabilities, 2 or 4 way entry forklift pockets, a twist lock tie-down capability, interior polish or linings and more to fit your transportation requirements. For international transportation needs we can certify our IBCs as ASME, Sec. VIII, Div. I design codes (CODAP, AD-Merkblatter and BS5500 available) for international approvals under US DOT (49 CFR), IMO (IMDG Code) RID/ADR, Customs/TIR. 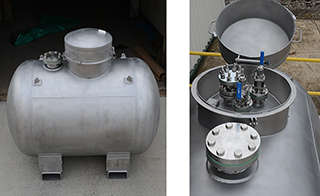 Columbiana Boiler Company manufactures horizontal ASME tanks for the transportation of high purity rocket propellants for the commercial and defense satellite industry. As a primary contractor to both commercial and government aerospace and satellite contracts, CBC has the resources to design and build the most sophisticated chemical transportation containers. One of our most successful projects has been the design and build of 700-gallon horizontal ASME tanks to transport rocket propellants. 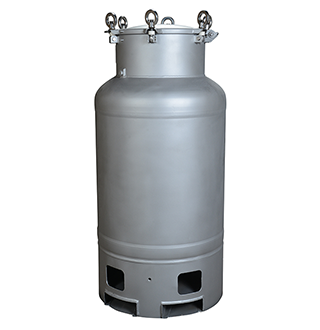 These tanks are manufactured to meet a very strict purity specification in order to satisfy our commercial and government customer requirements. These ASME tanks are manufactured under a US DOT Special Permit authorizing a custom portable tank under the UN T50 standard to transport commodities under Class 2.3, Class 3, Class 6.1 and Class 8 hazard class and with the appropriate Competent Authority authorization, allowing for international shipments with multiple load/un-loads. Contact our sales office for more information.